Last year at about this time, I wrote a post previewing the World Series between the Yankees and the Phillies. Those of you who follow such things know that we were dangerously close to having a rematch of those same two teams this year, but as it happens, the San Francisco Giants just defeated the Texas Rangers to win their first world series since abandoning New York for sunny foggy Northern California in the 1950s. After the Giants went up three games to one on Hallowe'en, it was all but inevitable that they would win eventually. 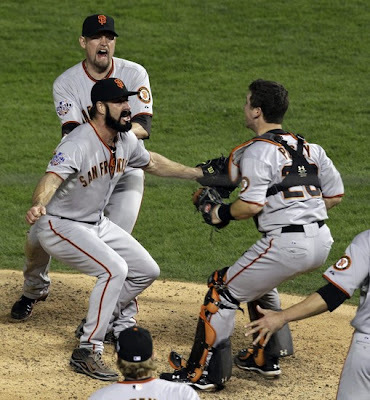 But Cliff Lee and Tim Lincecum put on a show last night, Edgar Renteria hit a big home run, and we ended 2010 in style. It's always a bit melancholy as a long season draws to a close, no matter the outcome. I have a belief that sports are as exciting as you want to make them, and for a baseball nut like me, I was able to relish every game, every play, every pitch that my schedule permitted me to witness. But as high as emotions rise in the climax of the season, right up until the crowning of an eventual champion, that's as low as the corresponding letdown takes you after it's all over. It was great fun to analyze and/or agonize over every moment of a grueling season and the dramatic playoff tournament... but now the grim reality of the situation is that there's no more baseball for nearly six months. Faced with the prospect of a long and dismal off-season ahead, my thoughts naturally wandered back to last off-season, my first as a semi-professional blogger. Last off-season included an overabundance of lists, as will this one, no doubt. But I don't want the '10 - '11 off-season to be a structural repeat of '09 - '10. Nor do I want my off-season activities to become a mind-numbing routine. And these preferences of how I manage my baseball related activities reflects how I feel about my real-life activities as well. I'm well aware that everything is cyclical in nature, but at what point do we all get bored of the same old cycles? And to what degree is our entire cultural machine an effort to keep us from falling into one big collective rut? I don't know the answers to these questions. Can rhetorical questions even have answers? Rhetorical answers? And what would distinguish them from plain old regular answers? Routines are easy. They take time to develop, but once a recognizable pattern emerges, that pattern becomes a plan. And the best kind of plan, at that: a plan confirmed by experience. Driving the same routes to and from work every day of the week. Tuning in to the same television shows at the same times. Even the act of love-making can become a painfully hilarious routine. Every year we celebrate birthdays, anniversaries, graduations, holidays (the new year itself has become a holiday). Every two years we vote. Every quarter, public companies report their earnings. What's to separate all these instances from each other except a number? That and our memories. Speaking of our memories... I've heard that our brains are better at recalling memories of an event if they are currently in the same state as when the original event was processed. This is why some kids who study for tests while on Ritalin don't perform well during the actual test when they're not dosed. And it might also be one of the reasons why sometimes it's hard to soberly follow up with friends you made while drunk. It's not that you just forgot the whole night; it's just hard for your brain to connect those two states, drunk and sober. There's probably some science to back this up, but if you really want to know, you should perform an experiment. Well, I've thought about it, and I think the same thing is true for mental states as well as physical/electrochemical states. So when I was experiencing the World Series in '09, I was creating/"recording" memories that are "triggered" when I experience the World Series in '010. And because one only has the chance to experience the World Series once a year, these memories are from a while ago. But, because I'm in the same mental state, the memories are especially potent. Which prompts the thoughts like, "That was already a year ago?" and "Where does the time go?" and "What am I doing with my life?" and "Where am I going?" Or "Where are we going?" The royal we, of course. As in, how will the collective experience of society at large turn out, in the long run? Or in the foreseeable future, for that matter? Are we just doomed to repeat the same series of events - world series, off-season, spring training, regular season, postseason, world series, ad infinitum - with nothing to differentiate them except when they happened on the grand cosmological timeline, and of course who was involved in them? Because if so that sounds a lot like an abridged version of the eternal recurrence of Zarathustra 3.2. And who says all this Philosophy doesn't come in handy. The question now becomes, as it did for Nietzsche, how we choose to deal with this realization. Do we accept it blindly, taking note of each cycle in passing as it spins past us? Do we ignore it completely, choosing instead to focus on the minutiae of everyday life? Or do we buck the system, live radically, and try to break the repetitive cycle? The choice is yours, and yours alone. I generally try to accept things as they happen (after an inevitable period of panic and frustration that accompanies change of any kind), and strive to be more adaptable in the face of ever-changing circumstances, while still keeping an eye on the big picture. But sometimes I freeze when confronted with these monumental events that mark a new year, season, era - because it's these moments that pull us out of the comfort of our routines and remind us that time is passing at a rate that none of us can control or even really understand. I myself am going to try to turn my statistical mind towards Football and Basketball to fill the monotony of the cold winter months. Or failing that, bury myself in video games and philosophy.